They build nests inside wood consisting of galleries chewed out with their mandibles, preferably in dead, damp wood. They do not consume the wood, however, unlike termites. 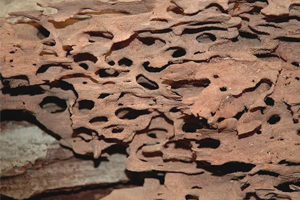 Sometimes, carpenter ants hollow out sections of trees. They also commonly infest wooden buildings and structures, and are a widespread nuisance and major cause of structural damage. One of the most familiar species associated with human habitation is the black carpenter ant (Camponotus pennsylvanicus). The genus includes over 1,000 species. Carpenter ant species reside both outdoors and indoors in moist, decaying, or hollow wood, most commonly in forest environments. They cut "galleries" into the wood grain to provide passageways for movement from section to section of the nest. 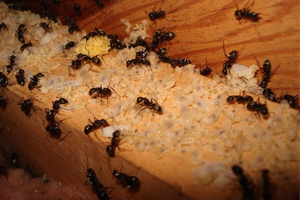 Certain parts of a house, such as around and under windows, roof eaves, decks and porches, are more likely to be infested by carpenter ants because these areas are most vulnerable to moisture. 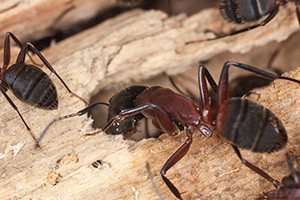 Carpenter ants have been known to construct extensive underground tunneling systems. These systems often lead to an end at some food source – often aphid colonies, where the ants extract and feed on honeydew. These tunneling systems also often exist in trees. The colonies typically include a central "parent" colony surrounded and supplemented by smaller satellite colonies. Carpenter ants are foragers that typically eat parts of other dead insects or substances derived from other insects. Common foods for them include insect parts, "honeydew" produced by aphids, or extra floral nectar from plants. Most species of carpenter ants forage at night. When foraging, they usually collect and consume dead insects. Some species less commonly collect live insects. When they discover a dead insect, workers surround it and extract its bodily fluids to be carried back to the nest. The remaining chitin-based shell is left behind. Occasionally, the ants bring the chitinous head of the insect back to the nest, where they also extract its inner tissue. The ants can forage individually or in small or large groups, though they often opt to do so individually. Different colonies in close proximity may have overlapping foraging regions, though they typically do not assist each other in foraging. Their main food sources normally include proteins and carbohydrates.